Restaurants run along Reuss Quay in Lucerne, Switzerland. 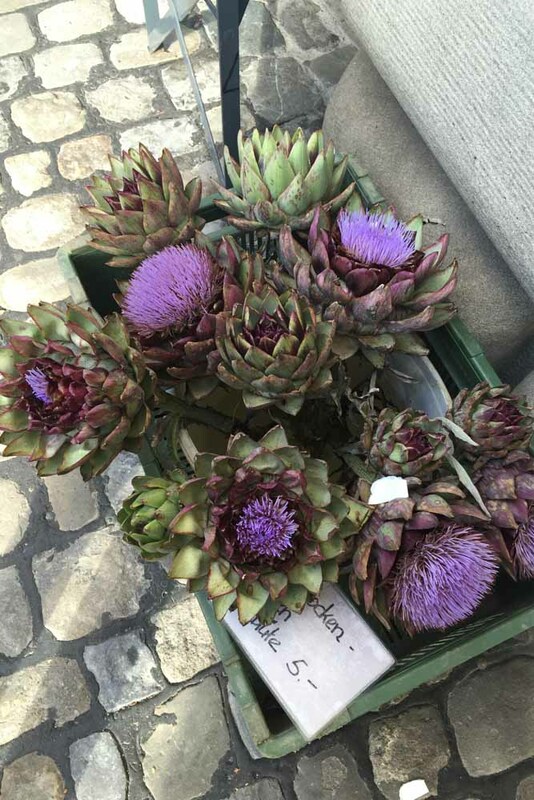 Fresh flower offerings in Lucerne; artichokes in bloom. 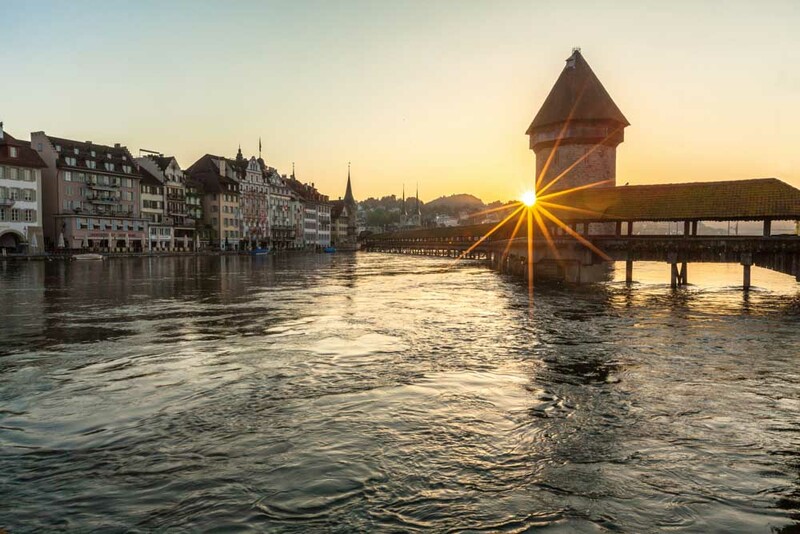 Sunrise over the Kappelbruecke, Lucerne. The buildings of Lucerne have a medieval charm to them. With a tranquil riverside setting (complete with gliding white swans), an evocative old town and a joyful, buzzy vibe, this is one of Leigh-Ann Pow’s favourite cities. It will soon become one of yours with her essential Lucerne city guide. Chapel bridge, Lakeside living, and its compelling history. Brasserie Bodu has lashings of atmosphere and a menu of French classics. Mill’Feuille is one of the best breakfast/brunch spots in the city, with a riverside setting. 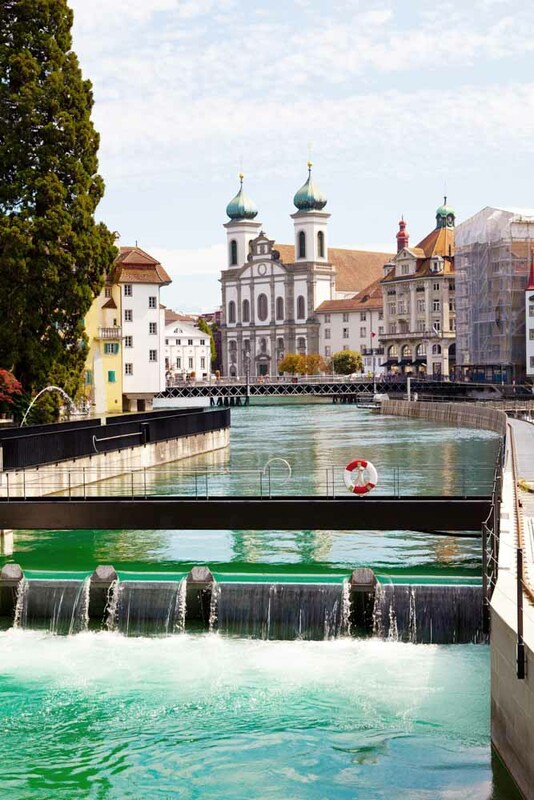 You absolutely cannot leave Lucerne without having seen the Kapellbrücke (Chapel Bridge); in fact, it is impossible to miss it given its prominent position snaking across the River Ruess, its planter boxes of blooms clinging to its sides and the ethereal white swans gliding underneath. Also check out the Spreuerbrücke a short walk down the river, with its Dance of Death paintings in its eaves. Architectural wonders in Lucerne don’t only date back to medieval times: the modern edifice of the KKL Luzern is a masterwork by the French Pritzker Prize-winning architect Jean Nouvel, sitting on the shores of Lake Lucerne. If you don’t venture inside its convention halls, concert hall and art museum, at least linger outside to soak up the atmosphere. Museum Sammlung Rosengart, located in the New Town on Pilatustrasse, is filled with artworks by the likes of Cézanne, Monet, Chagall, Braque, Kandinsky, Léger, Matisse, and Miró. They are all part of the private collection of father and daughter Siegfried and Angela Rosengart, which the latter donated to the city. The real crowd-pleasers here are the works by Paul Klee and Pablo Picasso, both of whom the Rosengarts knew personally. The Picasso collection includes portraits the artist painted of Angela herself. A sundrenched beach isn’t the first thing that springs to mind when you think of a medieval city like Lucerne, but it has an extremely nice one. The lakeside lido at Lucerne Nationalquai allows visitors to take a dip or loll about on in the summer sun. There’s even an historic angle: while it looks like a giant wooden box, inside its Belle-Époque charms are instantly evident. Of course there are myriad high-street stores to peruse in Lucerne, but for a glimpse into how the locals live, you absolutely can’t miss the regular markets that fill the city with colour and action come the weekend. Straddling both sides of the river, the majority of the stalls are dedicated to food, with bread being baked fresh in giant mobile ovens, abundant fresh fruit and vegetables, cured meats, copious cheeses and lots of local specialties. The fresh flower stalls are also glorious and if you keep wandering the stalls towards the Nadelwehr you’ll find a small flea market – the best place to grab a really unique souvenir like a rustic old cow bell. 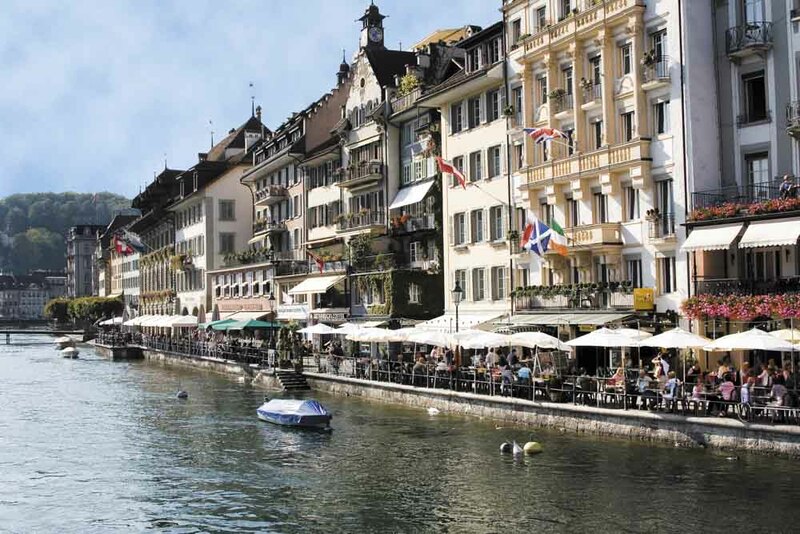 Founded in the 12th century, the history of Lucerne is written large in the glorious buildings of its Old Town. The absolute best way to see this part of the city is by strolling the cobbled streets and narrow side streets, stopping often to crane your neck in order to fully take in the architecture (check out the Kornmarkt and Rathaus) and exquisite painted murals that adorn many of the buildings. Forget taking a map, just get lost in the atmosphere and romance of it all. Konditorei & Cafe Heini (Hertensteinstrasse 66) is widely accepted as the best place for cakes in the city – two dishes here are on the official list of the culinary heritage of Switzerland. Also try the delightful Cafe Mardi Gras. Housed in a 700- year-old building, Stern Luzern’s bright rooms are freshly renovated. Hotel Ameron Flora has nicely presented rooms, a large lobby lounge/library and a funky vibe. The grand Palace Luzern sits on a lakeside promenade. and boasts all the five-star luxuries. Lucerne also has a top class transport museum featuring car, trains and areoplanes. Fantastic. Have to agree about the Transport museum. Also go for a ride on the paddle steamers on lac Lucerne. A truly fun experience esp. on Sunday afternoon when they are all out on the lake.